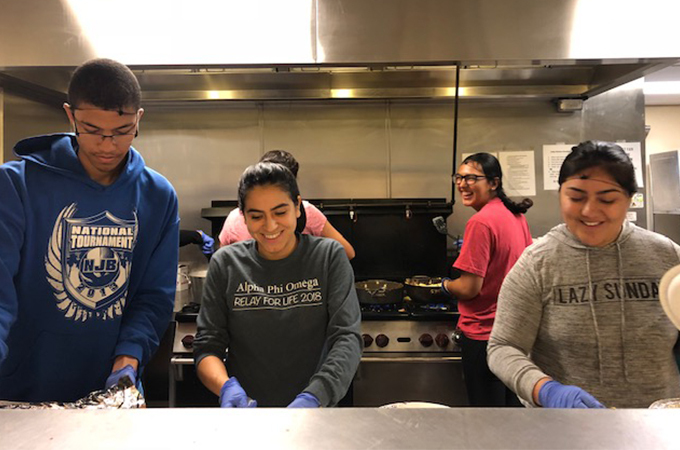 Elijah Brown ’22, Sophia Luna ’20, and Samantha Vasquez ’22 regularly volunteer to prep, cook, and serve breakfast at the Family Service Association of Redlands on Friday mornings. It was 8:45 a.m. on a Friday in October. In the kitchen of the Family Service Association of Redlands (FSA) on Lawton St., four University of Redlands students and Associate Director of the Office of Community Service Learning (CSL) Amy Moff Hudec ’01 were busy prepping eggs, sausages, hash browns, and coffee. They plated the food and set it on the counter. Outside the dining room, a line was forming. Young children with their mothers, homeless men who left shopping carts loaded with their belongings parked by the doorway, and a number of couples made their way into the dining room at 9 a.m., when Sophia Luna ’20, a CSL student ambassador, opened the door. More than 80 people filed by to pick up their plates, then sat down to eat; couples shared entrées; children were fed by their parents. After everyone was served, a few came back for seconds. The whole time, the student volunteers worked to keep the food coming; it was one of the busiest mornings yet. Set on a cul de sac beside the I-10 Freeway and housed in a cluster of buildings, FSA provides Redlands community members in need with basics such as food, clothing, and housing. The organization, which has been around for more than 100 years, has worked with the U of R in various ways over the past 20 years. Recently, CSL established two new student ambassador positions, which were filled by Luna and Mia Montanez ’21, to serve FSA exclusively. This new venture began after the CSL student directors and ambassadors, led by Katie Argumosa ’16 and Justine Doyle ’18, conducted a training day at the FSA. “We always like to include a service component in our training, so we all volunteered to serve breakfast at FSA one day,” said CSL Director Tony Mueller. It was so successful that Mueller wondered out loud, “Wouldn’t it be nice to have a regular day where we could help out?” That is exactly what Luna and Montanez have put into place. Their first day as regulars was September 21. Now each Friday morning, the ambassadors and volunteer students drive to FSA in a reserved U of R van. For some students, it is a one-time experience. Others have committed to attending regularly. The team, which has ranged from 5 to 10 students, arrives at 7:45 a.m., preps the food, cooks, serves from 9 to 9:30 a.m., and does a full clean up. They’re back on campus by 11 a.m.
Luna and Mia Montanez meet regularly, and coordinate with FSA to ensure that the breakfast service runs smoothly. They’re hoping to recruit volunteers from all over campus—from the Greek community, athletics, clubs and organizations, and even faculty and staff—to help out as well. If you’re interested in volunteering at FSA on Friday mornings, please contact Sophia Luna, sophia_luna@redlands.edu. To learn more about CSL, visit the University of Redlands Community Service Learning webpages.